Customer Relations | Social Activities | CSR | ESPEC CORP.
We provide environmental testing devices used by our customers in their QA(Quality Assurance) activities. As such, the quality of our products is directly linked to the quality of their products, and we feel that this heavy responsibility represents why we are in business. Based on our basic philosophy to “provide more reliable products and services that allow our customers to safely, comfortably, and surely fulfill the mission,” we at ESPEC work towards creating high-quality products that meet the expectations of our global customers. We have established a unique system we called EQA (ESPEC Quality Assurance) in Japan and overseas. In 1993, we were also assessed for and obtained the ISO 9001 (international standard of quality management) certification ahead of the competition. Following that, we completed ISO certification update in 2015, and we have been continuously improving our quality assurance system. We are shifting QC activities, which are mostly conducted at our production sites, to "small group activities" performed daily by all employees in order to improve customer satisfaction and create added value. These activities have been implemented as QMC (Quality Management Circle) activities. Every year many small groups working on improvement activities, quality improvement and cost reduction, improvement of work efficiency, and other endeavors were able to achieve formidable results. ESPEC was an exhibitor at BATTERY JAPAN, the world's largest exhibition on secondary battery and storage battery manufacturing and development. Our exhibit included the Advanced Battery Tester, a battery charge-discharge evaluation system with an integrated temperature chamber, and the Environmental Stress Chamber AR series, which evaluates sample durability during rapid temperature changes. We also offered seminars on testing trends and safety evaluation examples for battery modules and battery packs. Participants included expo-goers not only from Japan but also from overseas, including China, Taiwan, and Korea. In November 2017, ESPEC and our agency in Germany jointly exhibited at productronica — the world's leading trade fair for electronics development and production — held in Munchen, Germany. 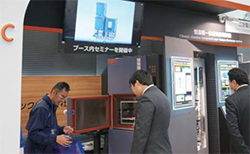 We exhibited a range of items including thermal shock chambers and environmental stress chambers that conform to test standards such as the IEC 60068 series commonly required in automotive markets. Around 126 participants from around the world visited our exhibit. The ESPEC Reliability Seminar 2017 was held in Tokyo and Osaka as an activity to provide customers with valuable information on reliability tests. A total of 248 customers participated in the event. The theme of the seminar was "HALT (Highly Accelerated Limit Testing)" accelerated testing, which has become popular for shortening product development cycles. Our introduction of the latest information on the global trends of environmental testing standards for electric vehicle equipment was well-received by participants. Website for engineers, "Test Navi"
We have developed a website specializedin information on reliability technology for engineers called "Test Navi. "It gives customers helpful information in practice settings, such as environmental testing knowledge, basic information on reliability technology, and the latest testing trends, at the appropriate timing. The number of members registered with "Test Navi" currently exceeds 16,000. ESPEC offers customers a centralized management system that can monitor the operation status of multiple devices via the network. The system makes tests more efficient such as by eliminating the need to patrol and check the operating status and results of each test device. Industry's First "Five-Year Product Warranty"
We have been offering the industry's first "five-year warranty" for four of our mainline products in Japan. The warranty covers free repairs for five years following the installation of our products. We provide customers with peace of mind through the services we offer as a company that possesses high-quality products and a solid service network. We are carrying out training for field engineers at overseas agencies so that our international customers can use ESPEC products with peace of mind. 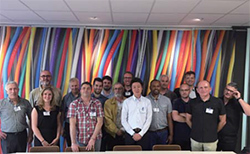 In fiscal 2017, a total of 27 field engineers from eight countries — including Germany, France, Turkey, Russia, and Taiwan — took part in the training, which included activities geared toward improving equipment malfunction troubleshooting. In 2003, ESPEC established the industry's first customer center for responding directly to inquiries. In fiscal 2016 we changed the center's name to Customer Support Desk and strengthened our support network to also include equipment troubleshooting. This allowed us to offer one-stop solutions to various problems, from product purchasing to product disposal. All our operators have acquired telephone response skills test qualification and regularly participate in internal training on the proper way to respond to customers, further improving customer response quality. To ensure that our customers can use our products with confidence and peace of mind, ESPEC offers optimal preventive maintenance and 24/7 on-call services at 15 service centers across the country. Moreover, through our ESPEC Online Support service, we can detect any anomaly in a customer's system through a network and contact the customer accordingly. From now on, we will strive to provide prompt service that meets the expectations of our customers.